First I want to say, that making a game, even a simple one is a huge effort that many single game developers don't even succeed doing. I do congratulate the creator with this achievement. That said, the game is not very good, the controls all sluggish, the enemy ships physics/movement is weird and the missions are just one goal given to you for no reason, you can play through all 30 with different levels of difficulty. You can fly a few different ships (X-wing, A-Wing, B-Wing, Millenion Falcon) and pay credits you earned after completing a mission to upgrade those ships. The enemy ships kind of fly in your sight and hoovers in front of you for a while before flying away, when they are hit or evade, it looks like they are hit by an invisible force causing them to twitch and turn at high speed. I found some similar games like that, "Star Wars Next" is one of them, with even worse controls and worse graphics: Play.google.com. I though to myself, perhaps I should release a Star Wars game on the Android Store that is actually good. The current Star Wars game, Star Wars Squadrons which I had under development for quite some time has made me a novice but decent low-poly star-ship modeler, and I can easily do the programming. For a sample of the star-ships I created look at the picture below. 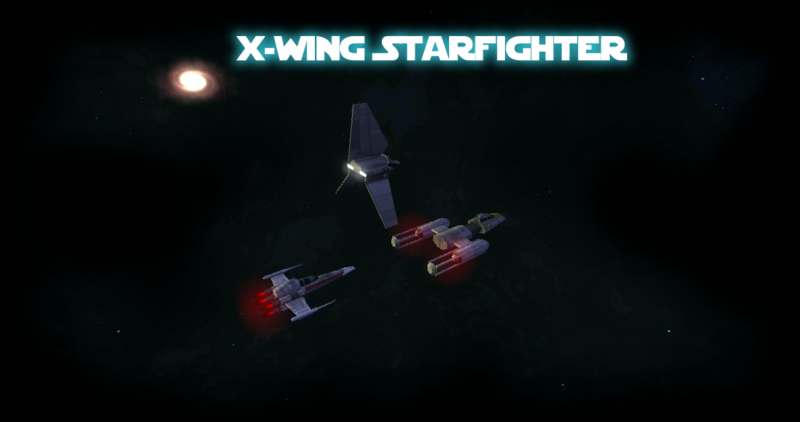 All the code for Star Wars Squadrons can be reused when making X-Wing Starfighter, which will be almost the same game, but single-player and a bit more casual. All support I can get to make this game is appreciated. I will probably release it on iOS and PC after the Android release. Is this thing alive? I love the X-Wing Flight game and I would love this to be playable on android!